Many poker players can make good decisions at the table with a reasonable frequency. Nevertheless, there are numerous situations where even very experienced players behave in predictable ways. These deeply-ingrained habits lead them to make mistakes. The problem is that these situations won't often arise at the table by chance - you have to make them happen. 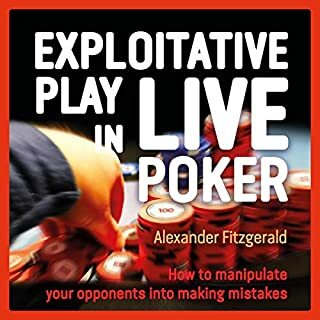 Exploitative Play in Live Poker is a ground-breaking work that teaches you how to create the circumstances where your opponents will be likely to blunder and how to exploit them when they do. If you know Phil Hellmuth then you either love him or hate him! His rants, tirades, and lines like "I can dodge bullets, baby" and "If it weren't for luck, I'd win them all" are epic and have earned him the nickname "Poker Brat." However, whether you love him or hate him, he is undoubtedly the greatest poker player of our time. Phil is a global poker icon who holds every record at the World Series of Poker, including an extraordinary 14 world championships. Each and every poker player featured in The Pursuit of Poker Success has taken his or her own route to becoming one of the world's best players. 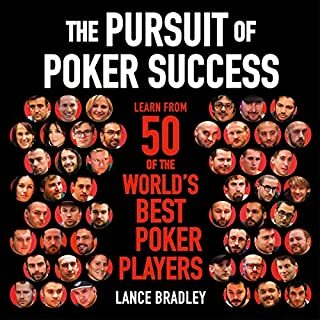 The players interviewed for this audiobook include World Series of Poker bracelet winners, World Poker Tour champions, online poker wizards, and some of the best cash game players on the planet. Bradley spoke to each player about the way in which he or she found success in a game that can be humbling for so many. What worked for them can work for you. Narrated by: Phil Hellmuth Jr. Play Poker Like the Pros is the perfect introduction to the world of poker, including tournaments, home games, and online play. Hellmuth begins by explaining how to set up and play the games and then moves on to basic and advanced strategies. You'll learn exactly which hands to play, when to bluff, when to raise, and when to fold. In addition, Hellmuth provides techniques for reading other players and avoiding "going on tilt" - poker speak for staying cool under pressure. There is a lot of money to be made at small-stakes no-limit hold'em because...surprise, surprise...most of the players aren't very good. However, few players understand exactly how to exploit these games. Competent players who generally play larger stakes will, of course, beat them. But they won't beat them for nearly as much as they ought to. Why? Because they don't understand how to adjust correctly. Most players struggle with AK due to small leaks in their strategy. So Optimizing Ace King (OAK) doesn't look to give you a bunch of memorized plays and tactics. Instead, OAK shows you how AK fits within your strategy and ranges. This prepares you for playing AK, among other hands, in a variety of spots and under a variety of conditions. 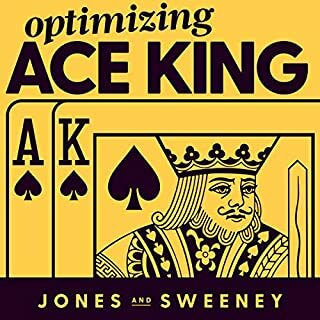 James "SplitSuit" Sweeney and Adam "W34Z3L" Jones co-wrote this book to take an in-depth look at poker strategy through the lens of a single hand. Concepts include 3betting, 4betting, cbetting, barreling, GTO vs. exploitative play, and more. Zachary Elwood is the author of the popular poker behavior books Reading Poker Tells and Verbal Poker Tells. Exploiting Poker Tells is the third and final book in Elwood's poker tells trilogy. In this book, Elwood focuses on practical, real-world considerations, answering questions like "When great poker reads are made, what factors are involved?" and "What behaviors are important to pay attention to and which should be ignored?" Unfolding Poker: Advanced Answers to the Most Frequently Asked Poker Questions is the latest book by best-selling author James "SplitSuit" Sweeney. This book takes questions ranging from "How can I use my table image to my advantage?" to "What should I do when my continuation bets stop working?" and gives actionable answers that you can use in your next session. Waiting for Straighters is about folding before the flop at no-limit holdem and pot-limit Omaha. It merges deep geek strategy with the painlessness objective. Clear, inventive poker strategy I used at once. Beyond statistics, beyond whether to raise, call, or fold, Elements of Poker reveals a new world of profitability for your bankroll and your life. You know tilt costs you money, but do you know how to make it go away? You know position is important, but do you really know how to profit from that knowledge? Elements of Poker is the distilled wisdom of a master. Published in 2007, this book is praised by poker pros worldwide as a timeless classic. Great version of a great book! In this action-oriented audiobook, Sky Matsuhashi presents an easy-to-follow road map that will help you build necessary preflop skills, making online poker easier and more profitable. If you’ve ever wanted to know if you have what it takes to be a professional poker player, now is your chance to find out. We’ve brought together some of the best pro players from around the world to talk about what it's like playing poker for a living; the good parts, the bad parts, the successes, and the challenges - everything that separates the winners from the losers in a game where fortunes can be won or lost on the turn of a card, and a level head and a quick wit control the table. In this book, Mike recounts his personal experiences and gives his take on some of poker's legendary characters over the past 40 years. If you enjoy poker, are fascinated by the development of the game, and enjoy compelling poker, golf, and gambling adventures, then you'll love Life's a Gamble. When poker players talk, they sometimes reveal information about their hands. Verbal Poker Tells describes the most common and reliable verbal patterns poker players have. More importantly, it gives you a framework for thinking about and analyzing verbal behavior at the poker table. The author analyzes many real poker hands: some from televised poker shows such as The World Series of Poker, Poker After Dark, and High Stakes Poker, some played by the author, and some submitted by other players. Your success doesn't have to be a gamble. 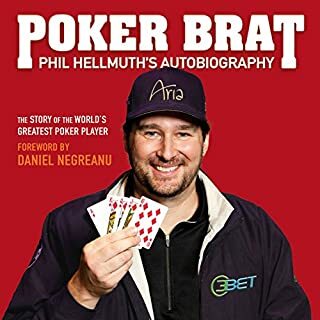 Phil Hellmuth Jr. is a New York Times best-selling author and 14-time winner of the World Series of Poker. His success isn’t a gamble - it’s the result of a daily practice of defining his goals and sticking to his personal code. How to know that you are in the right place at the right time, right now! The stakes are too high to leave your life to chance. Start right here, right now. Listen to #POSITIVITY to up your game and play a winning hand with your life. I love Phil. I love poker. This is a good book explaining his life view about staying poitive and focused. A few gems in there...his poker brat book covers many of the same points. Great book. Very easy read. I took away some great tips and insight. Thank you for writing this book. I look forward to the next one. I've played poker professionally for over a decade and played multiple times with Phil, he was always a gentleman... however I never even thought to read his book...after an amazing interview with Jordan I picked up this book and am so happy I did. Some great ideas here. Some unique ideas. I really wish there were more context and details. 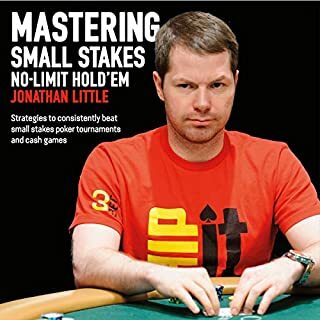 Excellent audible/book for any poker player looking to be a little more positive. I loved hearing it narrated by Phil himself, you could hear what he wanted emphasized better than if you just read it. short and sweet just the way I like it. I'm already using the mirror method! Another great one by the greatest. FWIW, there's some of the same stories in Phil's autobiography, but these are told in a way that sheds a different light, and it's truly insightful to hear his perspective on his many good fortunes, and there's definitely some solid advice if you'd like to follow in his footsteps. Audiobook (audible) is my format of choice, mostly to hear it the way the author intends it to be told. A shorter book than I'd like, but looking forward to the next one phil! 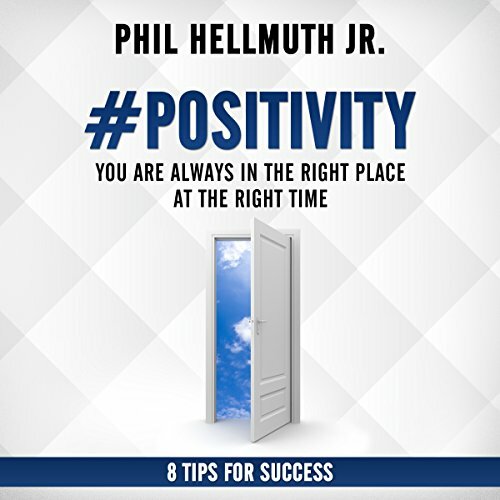 As an avid Phil Helmuth fan who has listened to his auto biography on Audible which was amazing value and contained 95% of what is in #Positivity I can't help but say I was slightly disappointed Phil. Because you did such a good job on the first book it set high expectations for me which just weren't met. However I did still give this book 4/5 stars. The reason why I rated it so highly was because I feel like Phil's intentions were good and if you are a listener who hasn't read/listened to the autobiography then this experience may resonate with you more because its fresh material (For you). To the returning listener , this book acts more like a bookmark of that really motivating material that was given to us in the autobiography. 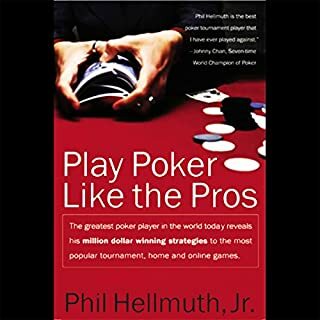 I am applying lessons from Phil in this book to my life and am thankful for all the advice this Poker Master has to share. #POSITIVITY II will definitely be worth the wait I am sure and I will obtain it as fast as humanly possible. If you did enjoy this book , go out and get Poker Brats Autobiography for more insight. Phil does an amazing job as a Narrator and it gives the more personal aspect to the book and feels like a 1 on 1 mentoring session than a book and that's where this book earns its stars and redeems itself. Thanks Phil for this experience and I look forward to many more.